It was launched in 1925 in a clear glass bottle and, after a few early problems, the marketing team they considered the possibility of changing to a dark glass bottle, to make it easier to preserve the flavour. In the end they rejected the idea and retained what has become the iconic transparent bottle. It was a decision that has ultimately proved to be key to the success of the brand but perhaps not in the way they expected. A beer becomes ‘lightstruck’ when it has been exposed to ultraviolet and visible light for an extended period. The light causes the vitamin riboflavin, which is present in beer, to react with and break down isohumulones, a molecule that contributes to the bitterness of the beer and is derived from the hops. The resulting molecule, 3-methylbut-2-ene-1-thiol, is very similar chemically and in odour to the musk-borne mercaptans that are a skunk’s natural defences. The net result of which is that lightstruck beer is often said to be “skunked” or to taste “skunky”. It is to prevent this problem that most beers on the market are served in dark bottles, and indeed other leading Mexican beers like Dos Equis and Tecate have always been produced in brown bottles. Corona however had decided to persevere with its clear bottle and hope that any problems would be minor. All went well and the brand flourished, becoming the #1 beer brand in Mexico in 1935. However when the brand started to be shipped to the USA in 1976, after the long journey and exposure to the sun, some people started to complain about the taste again. The team at Corona, feeling that their distinctive bottle was by now a well-established equity of the brand and hoping that any problem with lightstruck beer wouldn’t be too widespread, decided to stick with the clear bottle. Instead of changing the bottle or trying to address the cause of any problem, they looked for ways to mask it if it happened. They hit upon the idea of putting a wedge of lime in the neck of every bottle to sweeten the flavour and hide any possible ‘skunky’ taste. The solution turned out to be better than they could have ever imagined; not only did it overcome the taste problem, it led to a huge growth in sales. Corona had created, almost inadvertently, a drinking ritual which was to give them a real point of difference. 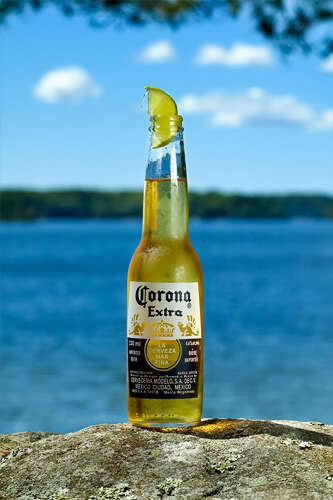 Corona soon became the #1 imported beer in the US and is now available in over 180 countries around the world. The bottle with a wedge of lime protruding from its neck is now a well-established communication equity for the brand. So much so that they tried to register the image of a clear bottle with a slice of lime in the neck as a community trade mark, but, on the 30th of June 2005, the European Court of Justice rejected it as indistinctive. Not surprisingly, many other Mexican beer have now adopted the wedge of lime ritual but Corona still remains the leading Mexican beer brand.